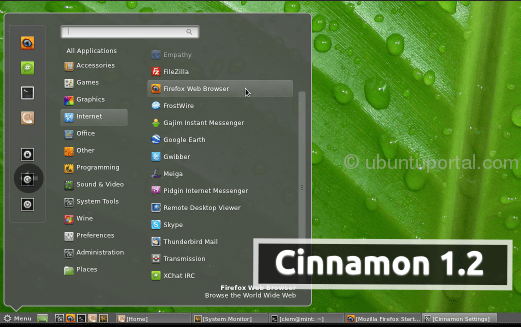 Cinnamon 1.2 New desktop environment for Linux has been released, the new release comes with many new features and changes. 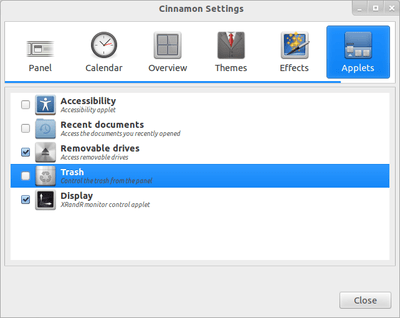 In addition, Cinnamon 1.2 also comes with an Improved Main Menu, new desktop effects fade and scale, for customization,added a new configuration tool called “Cinnamon Settings” and additional configuration options, five new applets (Accessibility, Recent documents, Removable drives, Trash, and Display (XrandR monitor control), and added the ability to change the layout of desktop. Applets, Cinnamon 1.2 includes “applets” for the first time, and they’re “probably the coolest new feature in Cinnamon, for both users and developers,” Lefebvre wrote. Five such mini-extensions are now included in the software, as shown below, and they’re essentially optional parts of the desktop that add content to the panel. 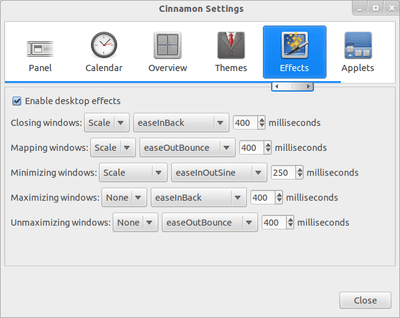 Customizable Desktop Effects, Much the way Compiz and Metacity ushered in a raft of customization options, so Cinnamon 1.2 aims to reintroduce desktop effects and to give users the ability to “define fancy animations or to turn effects OFF altogether,” Lefebvre explained. Accordingly, two new animation plugins are included in the software, as are 30 transition styles. Users can also define the duration of each animation, opening up a wide range of customization possibilities. A New Window Manager, A number of under-the-hood changes move Cinnamon 1.2 even “further away from any kind of compatibility with GNOME Shell,” Lefebvre explained, and one of those is Muffin, a fork of the Mutter window manager that replaces Mutter in Cinnamon 1.2. The desktop is also no longer compatible with GNOME Shell themes, he pointed out, though it is still possible for a theme to define styles for both GNOME Shell and Cinnamon and to be compatible with both. 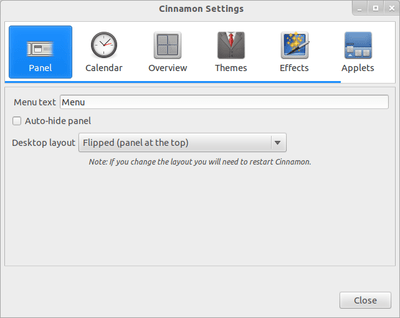 Multiple Desktop Layouts, Also part of the Cinnamon project’s desire to reintroduce customization options from the past is the software’s support for multiple desktop layouts, including traditional, flipped, and classic styles, varying primarily in panel placement. The “flipped” layout, with panel on top, is shown below. A Spruced-Up Main Menu, Cinnamon 1.2 features a main menu that has been improved since the desktop’s early versions, with menu definitions that are now handled by the desktop itself. “If you search for something, the categories now become inactive so you don’t hover them by accident just to see your search results disappear,” Lefebvre explained. Users can now also simply press “Enter” after a search to launch the first item in the search results. ‘Bug Fix Galore’, Finally, since the start of the Cinnamon project, no fewer than 130 bugs have been fixed, Lefebvre noted, thus making version 1.2 the most robust Cinnamon yet.